Joan Crawford and the Handsome Bartender! YOU WOULDN'T HAVE BELIEVED IT either. Here the guy was, tending bar at a plush restaurant in Beverly Hills, when a waiter walked up and said a dame wanted to talk to him on the phone. 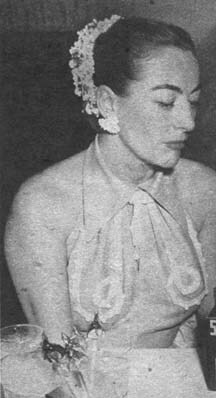 Answering it, the barman heard a low, throaty woman's voice announce, "This is Joan Crawford." Well, what would you have done? Just before slamming down the receiver, he said, "Yeah? Well, I'm Robert Taylor." "No, really, this is true," the husky voice continued. And would you like to know something? It was true. What's more, only a few days later the amazed bartender ended up with Joan at seven in the yawning -- in Joan's very own house at 426 Bristol Avenue, Brentwood. What did the acknowledged Queen of Hollywood want with a bartender? She was a gal bachelor in those days -- before her marriage to Pepsi-Cola king Alfred Steele -- and could have had half the leading men in the movies at the snap of a finger. But it happened -- a dizzy, daffy romance which began with that telephone call to a man Joan Crawford had never even met. What Her Cinema Highness had in mind didn't come out at first. Smoothly, she explained she was having a party for some friends and the cast of her movie, "Sudden Fear." Would he come around and tend bar? The bartender agreed and, later, was ushered to the side of La Crawford's swimming pool, where they discussed what was to be poured in the punch for the party the following Saturday. Joan was careful about the recipe but she didn't touch the stuff when the wingding got rolling. Her favorite refreshment turned out to be Vodka on the rocks in a Sazarac glass (a triple-sized old fashioned glass) and she guzzled it like water. The shindig moved faster than the Kentucky Derby. Half a dozen times during the course of the evening Joan would stop by the bar, pat the bartender's head and coo, "Baby, you're doing a swell job!" Once the glamourous Kay Spreckels, now Clark Gable's wife, moved in to ask Joan, "Where did you get this big hunk of man?" Joan smiled and said, "Stay away from him, honey, he's all mine." Not long after, she proved she wasn't kidding. By twos, threes and fours, the guests left, then the extra help. Those big eyes of Joan's became luminous as she downed another Vodka on the rocks. "You shouldn't be behind a bar," Crawford finally told the palpitating mixmaster. "You're much better than that." Taking him by the hand, Joan led him into the living room and over to the couch. They'd barely met. Could this be -- the Empress of Hollywood and a bartender? 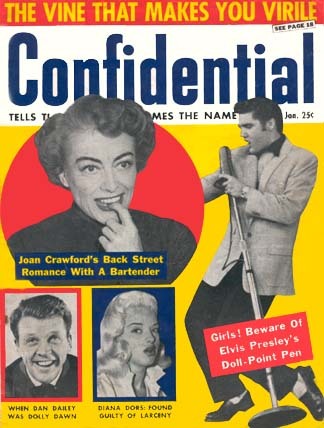 It not only could be, but the bartender soon discovered one other thing: Joan is even younger than she looks. The sun was shining brightly before Queen Crawford bade her boy friend good night. What's more, she was on the phone the very next night to arrange another party -- this one a simple little thing for two -- herself and the Martini Mixer. It was nothing if not regal. Joan flounced and frolicked as though she was still a "Dancing Daughter". Time rushed by and, once again, the booze-blender met the sun coming up as he was going out. That's the way it went for days and days and it's anybody's guess whether the commoner might actually have married the Queen, had it not been for one unfortunate habit of Joan's. Whenever she felt in the mood for a romp, she'd have her secretary call the bartender, as though she was ordering groceries. There was still another fly in the ointment. During some of their tenderest moments, Crawford would sometimes shudder and delicately tell the guy, "If my friends ever knew I was romancing with a bartender!" Well, what's wrong with the profession, if you know how to stir in the vermouth? It made him so mad one night that he stalked right out of the place -- leaving Joan breathless, and with nothing to do but pour her own Vodka. What with things like that, the romance cooled for a while, especially when the bartender changed jobs and went to work for a swank hostelry in Palm Springs. In fact, he hardly expected to set eyes on her again, until he looked up over a cocktail shaker one night and -- there was Joan, with a party of four. The Crawford cutie winked at him like a school girl as they sat at the bar and, when the group got up to go into the dining room, she even reached across the mahogany to squeeze his hand. The bartender was miffed. "What's the matter baby," he asked, "has someone else been eating my porridge?" If someone had, there was still plenty left. Joan gave him that famous toothy smile and whispered, "I'll call you later." She did, too, just as the bar was closing, to order two stingers on the rocks brought to her room. The bartender set out on this journey but never made it. He was intercepted by a gent who wanted to know where the drinks were going. When the bartender said to Miss Crawford's room, the gent replied, "I'll take them. I'm going there myself." Now, what was that guy doing in the act? The giggle soup dispenser never did find out. In fact, it was six months until he even heard from Joan again, when she called him to arrange another party at her home. This one turned out to be the blowout to end them all. Celebrities by the dozens . . . Judy Garland, Barbara Stanwyck, Kay Spreckels, Jeff Chandler and Jane Wyman were a mere handful of those who showed up. The soiree started off with hot soup and got even more blistering as the champagne flowed. Over the entree one pert little minx stood up and proposed a toast starting with "When I was a chippie in Weehauken . . ." The climax came when another doll, loaded with the bubbly, slapped Joan right across her million-dollar profile. That did it. Weeping, Joan fled. Not even a telephone call from her walloping guest could stem the flood of tears. All La Crawford wanted was a drink and her bartender. Summoned by a maid, he brought the Vodka upstairs and stayed to kiss away Joan's tears. He must have done a good job at that, because an hour later Joan patted her eyes, powdered her nose and rejoined her own party downstairs. By this time Judy Garland was singing. She sang until dawn. It was all too much for the bartender. Wearily, he cleaned up. Sleeping, he said good night to Joan after fixing her another Vodka on the rocks. No gambols that morning. The poor guy was just too tuckered out. That's been quite a while ago, though, and he's well rested. Of course, Crawford is married now, so the guy hardly expects to hear from her. Certainly not a call to cuddle. And, as for mixing her a Vodka on the rocks -- well, what are hubbies for, anyhow?